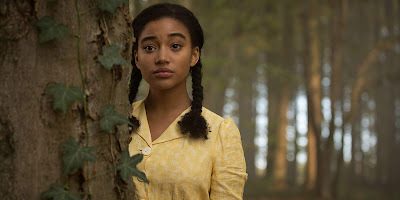 Sincer her breakout role in The Hunger Games, Amandla Stenberg has used her fame to champion causes important to her, while taking on roles that parallel those same issues. Her most recent film The Darkest Minds may not have attracted much of an audience but it was another story that found Stenberg as an outsider in a world that refuses to understand her. She's beginning to earn buzz already for two more such films arriving later this year, including the YA adaptation The Hate U Give, and the one that will arrive first, WWII drama Where Hands Touch. Where Hands Touch is directed by Amma Asante, who has explored mixed-race heritage in films Belle and A United Kingdom. Set in 1944 Nazi Germany, the story follows the daughter of a white German woman and an African man, who forges an unlikely bond with a compassionate member of the Hitler Youth. The new trailer begins with a tense search for the girl by Nazi soldiers while she hides under her home's floorboards. Even when she and her family move away to Berlin to be "invisible", she still experiences first hand the prejudice instilled by Hitler's regime. The film co-stars Abbie Cornish, George MacKay, Christopher Eccleston, and Tom Sweet. Where Hands Touch will debut at TIFF on September 9th before opening five days later in select theaters.